The Massapoag Saturday Sunfish Series got off to an excellent, if belated start this weekend. Five skippers came to try their luck. Keeping with the normal indecisiveness of the wind on the lake, a prevailing Westerly wind competed with strong gusts from the North all day long, forcing John Ekart and Noah Levesque on the race committee to set up two different courses. Then they would simply choose which course to use at race time depending on which wind was blowing. Even the best laid plans sometimes go awry as the wind decided to shift mid-race. Lifts and headers were the order of the day, and playing the shifts correctly led to big gains and losses out on the course. In a couple of races, the long downwind run turned into an upwind reach as the wind shifted 90+ degrees to the west. The racing was with the boats often being less than a boat length apart at the finish. John Houstle spent a lot of time rehabilitating his Sunfish over the winter and his 1969 vintage boat and it showed. His boat looked brand new, and burned up the course. John took 3 firsts, 1 second and 1 third on the way to capturing first place for todays racing. Bernadette Levesque brought her A game today too, running neck and neck with John all day, posting 2 firsts, 2 seconds and a third. Mark Stoughton was "close, but no cigar" all day long, taking 2 seconds and 3 thirds. Dan Abram, sailing in the club Sunfish, got 2 fourths and 2 fifths, and he very nearly took a third from Mark in the 4th race with a spectacular downwind run, loosing by just inches. Skip Russell continued his progress from last year, having excellent upwind legs in every race, and beating Dan Abram twice. The full results are on the new 2014 Saturday Sunfish Series Results Page. Racing continues this Wednesday with the Double Secret Series, and again next Saturday with the second week of the Saturday Series. 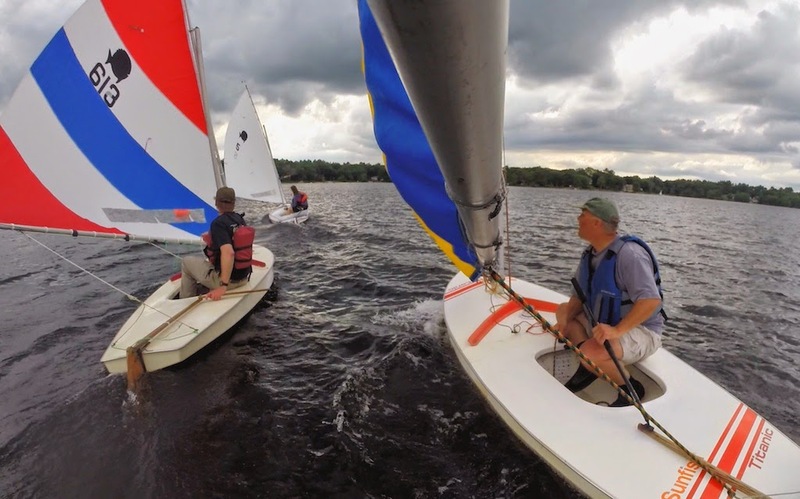 On the larger circuit, next up is the Wessegussett Regatta is on June 28. Would have loved to sail my Laser there again today but I was informed that all your Laser fleet were going to sail somewhere else. Maybe next week if the Laser fleet decide they want to stay home. It's the annual Sunfish Regatta at the Wessegussett Yacht Club in Weymouth. Bill Brangiforte also gives his annual rigging and racing clinic there before the regatta. The Laser guys all went to Duxbury. They're stealing our Laser fleet.